We’d love your help. Let us know what’s wrong with this preview of This Business of Artist Management by H. Lee Hetherington. 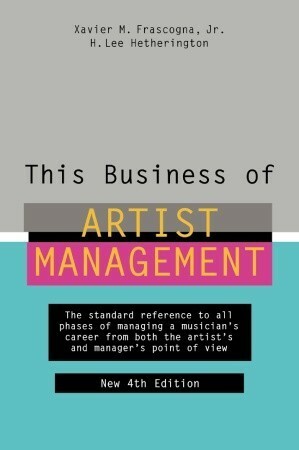 This authoritative reference on artist management in the music industry is the standard for all phases of managing a musician's career from both the artist's and manager's point of view. This substantially updated edition covers the major changes that have transformed the business world and music industry over the past six years. Particular emphasis is given to the impact This authoritative reference on artist management in the music industry is the standard for all phases of managing a musician's career from both the artist's and manager's point of view. This substantially updated edition covers the major changes that have transformed the business world and music industry over the past six years. Particular emphasis is given to the impact of the Internet, including the MP3 controversy and its lingering ramifications, copyright licensing on the Web, navigating trade identity issues on the Net, domain names, and the high-tech fight against cyberpiracy. Included are real-world examples-as well as new interviews with top booking agents, personal managers, concert promoters, record company executives, road managers, and artists. To ask other readers questions about This Business of Artist Management, please sign up. Really wasn't what I was expecting - it's mostly a weird hash of stuff from the artist's POV and from the manager's. You can tell it's outdated at this point, when the author writes (or completely ignores) about the role of technology and the internet. I wouldn't recommend it at all for those looking to stay independent for the near future or permanently. Everything takes place on a much larger scale, and the book advises time and time again to go to NYC/LA/Nashville to make it big, which is a de Really wasn't what I was expecting - it's mostly a weird hash of stuff from the artist's POV and from the manager's. You can tell it's outdated at this point, when the author writes (or completely ignores) about the role of technology and the internet. I wouldn't recommend it at all for those looking to stay independent for the near future or permanently. Everything takes place on a much larger scale, and the book advises time and time again to go to NYC/LA/Nashville to make it big, which is a decision that needs to be made carefully. Excellent guide to the elusive craft of successfully managing music artists. The authors present a wealth of information on topics from hiring a team to handling publishing to dealing with personal crises and more. All of this is laid out in a very straight forward manner with bits of personal insight and experience to drive home their lessons. I highly recommend this book to anyone interested in the music business. Another of my secondary class texts, Billboard painstakingly (and accurately) dissects what is necessary for a proper artist/manager relationship and how to make it productive and potentially profitable. Everyone aspiring to a performance career should read this book before hiring a manager. Everyone interested in management should read this book before acquiring the first client!